A pair of beloved ballet shoes, a personalized school trunk and a case full of musical cassettes all belonging to the late Princess Diana will be on display at Buckingham Palace as part of a memorial tribute marking the 20th anniversary of her death. Diana’s sons, Princes William and Harry, selected most of the belongings that will be on display as part of a larger palace exhibit. “Royal Gifts,” which features presents Queen Elizabeth has received throughout her 65-year reign, opens Saturday and runs through Oct. 1. The collection centerpiece is a desk where Diana read and answered official correspondence in her sitting room in Kensington Palace. 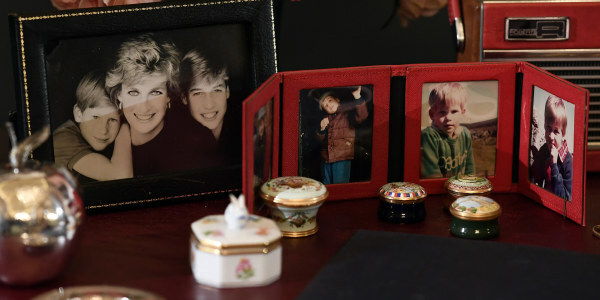 Numerous framed photos of her children sit on the desk, along with a silver Cartier desk calendar, engraved with her birthday and those of Prince Charles and their sons. The princess received it as a gift from former President Ronald Reagan and his wife, Nancy, during a visit Diana and Charles made in 1985 to Washington, D.C.
Diana, whom many people referred to as “The People’s Princess,” died Aug. 31, 1997 from a car crash in Paris. William was 15 when she died, and Harry was 12. Over the past year, both princes have spoken out extensively as part of a mental health awareness campaign about how they coped after their mother's sudden death. Harry revealed he sought counseling in the aftermath, and William acknowledged his personal guilt in the inability to protect his mother. Among Diana's other items on display are a case of cassette tapes featuring 1980s and ‘90s pop classics from artists including Elton John, Diana Ross, Lionel Richie and George Michael. The collection also includes classical works by Verdi, and opera icons Luciano Pavarotti and Placido Domingo. Buckingham Palace, the queen's royal residence, opens its doors to the public every summer. More than half a million visitors walked through the palatial halls as part of last year's summer opening.